The National Association of Environment Professionals was established in 1977 as a response to the increasing need for greater networking among environmental professionals and to establish a unified ethical code for these professionals to uphold. Today, NAEP continues to provide professionals within the industry, government, academia, and the private sector, to network with other members and gain access to newsletters, reports, quarterly journals, job opportunities, and more. 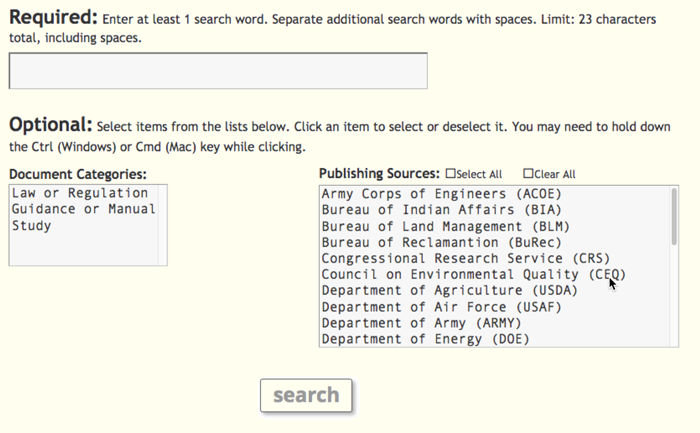 NAEP wanted to provide their members with a tool for searching environmental documents the website has archived. They had set up SearchWP and a search page, starting to implement filtering the documents by a few parameters, but it was not working properly. The goal for this project was to prove the document searching concept and provide some base functionality to perform environmental research. The main thing we tackled was the search results template that shows up when someone performs a search. We changed the template that sets the display of each search result item in a list of search results. That template had a bunch of information that we really didn’t care much about, and each result linked to a WordPress media page about the research document. To improve the user experience, we changed those links to go directly to the research document file, shortcutting the path to the end resource. The client wanted us to pass along the user’s original search term as part of the document url so those users with specific browsers and Adobe’s pdf reader installed would be able to load the document with their search keywords already highlighted. Allowing users to filter their search by Document Categories and Publishing Sources taxonomies meant displaying some new select fields on the search form and using the searchwp_include filter provided by SearchWP to limit our search query by taxonomy terms. A big thanks to Marc from Poison Dart Frog Media for entrusting us as their partner to take on this project. We really enjoyed working with Marc and the team at NAEP and will continue to appreciate the efforts of their members to keep our beautiful world green. If your SearchWP implementation needs a few tweaks or you are dreaming of some WordPress functionality that you don’t know how to achieve we would love to chat with you.